The New Orleans Jazz Quarters Creole Hotel is located in Faubourg Treme, steps away from the French Quarter, revitalized Louis Armstrong Park, and historic Congo Square. We call our property a “Creole Hotel” because it combines the unique architecture of Creole cottages with the amenities of a hotel and the charm and scale of an intimate New Orleans neighborhood. 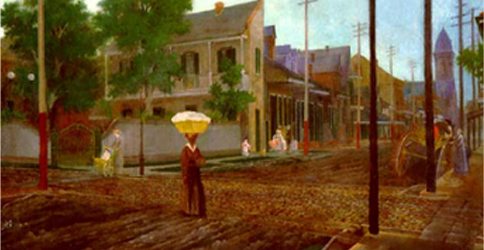 Like so many neighborhoods in New Orleans, the Treme played a central role in the history of the city. Originally known as “Back of Town, the neighborhood’s boundaries are Esplanade Avenue to the east, North Rampart Street to the south, St. Louis Street to the west, and North Broad Street to the north. 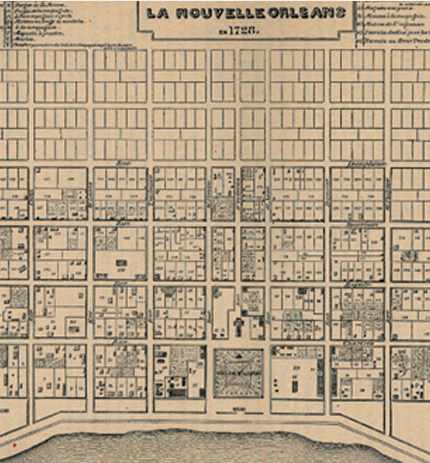 Perhaps best known as the oldest neighborhood of “Free People of Color” in the United States, Treme was the only place where people of color owned property before the Civil War. 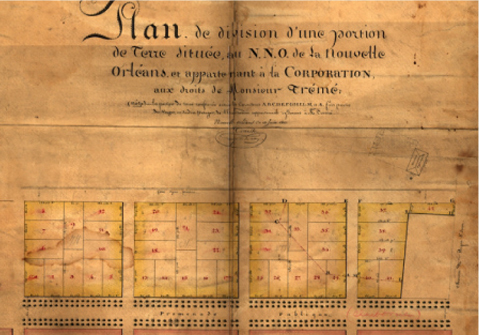 In 1810, the city of New Orleans acquired the remaining plantation land for $40,000 and followed Claude Tremé’s example, subdividing and selling individual plots of land. 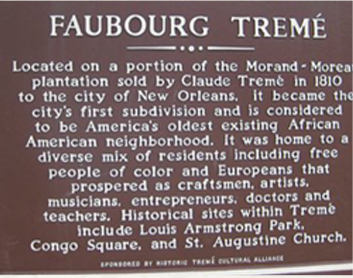 Faubourg Tremé became a part of the city of New Orleans in 1812, and soon after the first Creole cottages of the Jazz Quarters were built. The Jazz Quarters “Dolliole Cottages” were built by a family of carpenters and entrepreneurs who purchased a large lot that included 1125, 1127 and 1129 rue St. Philip from the City of New Orleans Corporation for $670 on July 18, 1816. In 1821, Jean Louis Dolliole built three cottages, then sold the three-bay Creole cottage at 1127 rue St. Philip to Louis Henry in 1857 for $1,900.00. It features one bricked and gabled end, a brick facade, and a framed, recessed, open gallery on the north Rampart Street side. The entrance is a reversed Greek Key molding. The lotus swirl, wooden brackets, and window-door cornices were added at the turn of the century. The house at 1127 St. Philip (now the Armstrong Cottage) changed ownership at least 15 times in the past 150 years. Although it was later removed, a 1971 Bruce Brice mural on the masonry wall of the rue St. Claude side of 1127 depicted the exodus of black citizens from the Tremé when the city administration began demolition for a cultural center in the 1960s. Another outstanding example of a three-bay Creole cottage, 1125 St. Philip has a brick front, one frame side, and one brick side with fire-extension parapet. It was part of the Dolliole property, built at the same time as 1127, with the same floor plan and materials. The history of the other suites – the Kermit Ruffins Cottage, the Pete Fountain Cottage, and the Connick Cottage – is still being researched, but we believe the structures were moved here from another location. We know that they are Creole Cottages of the same early 19th Century period. Jazz Quarters New Orleans was previously the Garlands Guest House, named for the owner who converted the property to a hotel in 1993. The property was purchased by the current owners in March 2011, and extensive renovations followed. 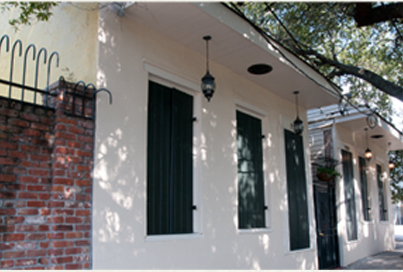 Identifying the origins and history of each of our Creole cottages is an ongoing process, and we continue to research the history of the land, architecture, and neighborhood surrounding the New Orleans Jazz Quarters. We owe a huge debt of gratitude to both the New Orleans Notarial Archives, which holds more than three centuries and some 40,000,000 pages of signed acts compiled by New Orleans notaries, and the Williams Research Center of the Historic New Orleans Collection. Information about our cottages can also be found in New Orleans Architecture Volume VI: Faubourg Treme & The Bayou Road (Pelican, 1980) by Roulhac Toledano and Mary Louise Christovich. Morand extends land ownership to present-day Governor Nicholls, St. Bernard Avenue, Galvez and Rampart Streets. 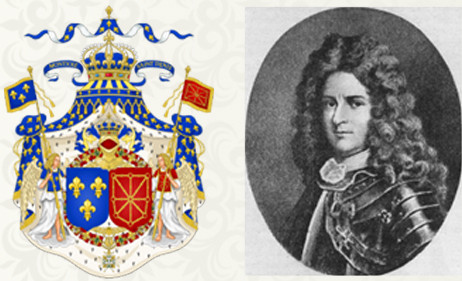 Morand dies; his wife Rene de la Chaise, remarries another plantation owner, Alexandre Latil. The property is opened for lodging for the first time as the Garlands Guest House. The current owners purchase Garlands Guest House. Pierre Le Moyne Iberville discovers the Mississippi River from the open sea. 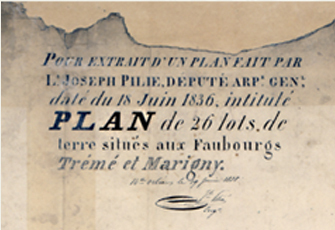 Morand’s son sells the land to Paul Moreau, whose widow, Julie Prevost, remained on the plantation until her death. The property passes to Julia Moreau, her granddaughter. 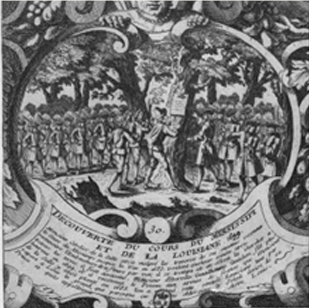 Claude Tremé, Moreau’s husband, subdivides the plantation sells lots to gens des couleur libres ( “free people of color”) and colonial settlers. The City of New Orleans acquires remaining land for $40,000 and continues to subdivide into lots. After purchasing the property, the owners have conducted important historical restoration and renovation projects, including updating amenities in the Mayfield, Trombone Shorty, and White suites, and the addition of the King Oliver and Bolden suites.